Teenager Ayato Kamina believes that he has grown up in the last city on Earth – Tokyo, protected by its defensive shield from an alien attack 15 years earlier. But Tokyo is really under alien control, its citizens are dupes of the invaders, and the “creatures” that are assaulting it are actually the human resistance trying to break through. No, this is not a manga. This is a novel based on the first five episodes of a 2002 Japanese cartoon, itself a derivative respray of Neon Genesis Evangelion, with a twist straight out of The Matrix. Writer Hiroshi Ohnogi unwisely uses multiple first-person viewpoints for people who all sound exactly alike. This makes very little sense unless you’ve already seen the scenes it recounts, with Ohnogi hoping his readers’ memories of the TV series will fill in blanks like, you know, description, background and characterisation. In his Afterward (sic), he boasts that he got the writing job because he went to school with the director. The translation isn’t even sure what tense it should be in, which doesn’t help. (This review first appeared in DreamWatch magazine sometime in 2008. I think they were hoping that as a Japan specialist, I would find some redeeming feature in the book, which is truly one of the worst I have ever read). 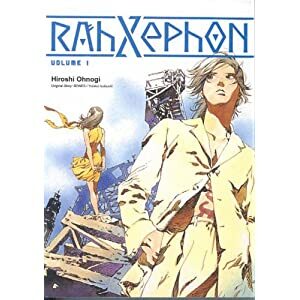 This entry was posted in News and tagged Rahxephon by ixarette. Bookmark the permalink. Damn, the other comments on this thread have disappeared. I am the culprit — I must have deleted them while sweeping up great vistas of spam. My own comment was something like ‘I didn’t like RahXephon very much’ which I’m sure you were all fascinated to hear.